The Southern states which formed the Confederacy in 1861 fielded many units of volunteer troops wearing a remarkably wide variety of uniforms, often reflecting foreign influences. In a spirit of independence many states also issued their own uniform regulations on the outbreak of the American Civil War; and these non-standard uniforms were often retained until well into the course of the war. The regulation patterns centrally prescribed by the Confederate Army were only ever followed unevenly, and state quartermasters continued to issue uniforms showing regional and state differences. 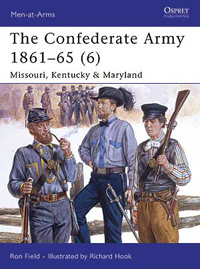 This last in a series of six titles studies the archival and pictorial evidence for the infantry, cavalry and artillery of the final states to secede from the Union - Missouri, Kentucky and Maryland - and is illustrated with fascinating early photographic portraits.